We've not seen Triple H on WWE TV in quite some time. Summerslam is right around the corner so one could only assume that he will NOT take part in this huge event. Regardless, over the years, Triple H has had some classics at Summerslam and some not so classics. Today, I look back at his 5 best matches at the summertime PPV event. Let's get into it. -This is probably his most underrated match and feud. Foley and HHH had so much chemistry and while their 2000 battle was a huge feud for the company, in 1997, they had a damn good feud as well. This match was amazing and inside a steel cage, the old blue one to be exact. Mankind would win this one with a huge elbow drop off the top of the cage, but HHH definitely put in a great performance. -Another underrated match that saw DX reunite and take on the up and coming Legacy, and get pushed to the limit. The chemistry between the two teams was evident and I enjoyed the watching them go at it. HHH and HBK picked up the win of course, but this was a great match by all four participants. -This match was a mess. Angle got injured early on and from there it just got crazy, but in a good way. HHH and Rock did most of the match, but Angle eventually came back and helped finish out the match, and Rock walked away retaining his championship in this main event, but this was a great match. It's no shock that Triple H still shines even in a losing effort. -This is basically tied for no. 1. I can't really choose, but I'd place this at no. 2 if I had to choose. This ladder match for the IC Title was great and showcased both men as huge stars for the future. Triple H and Rock went at it for almost 30 minutes in one of my favorite ladder matches ever. A certified classic and if you had this at no. 1, I couldn't fault you at all. -This is the one. A classic and the best HHH vs HBK match in their 2 year rivalry saga in the 2000s. HHH had forced HBK out of retirement and none of us knew what to expect. 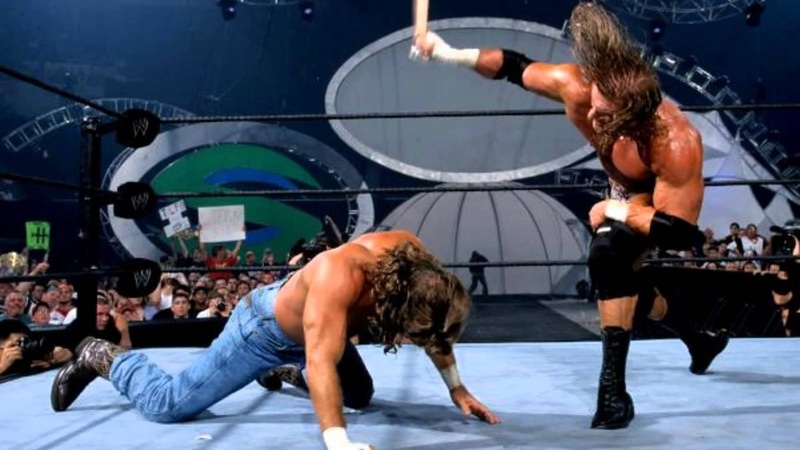 HBK hadn't wrestled in 4 years so we expected a brawl and while that was some of the match, we got an amazing contest that is still one of my personal favorite HHH matches overall period. A true classic match and his best at Summerslam.